Ah the jukebox musical, we meet again. This genre is the most nakedly commercial inhabitant of a bulging West End, landing somewhere between the X-Factor and karaoke in artistic validity. But I shouldn't judge, after all Thriller Live has been moonwalking around Shaftesbury Avenue since 2009. In a cutthroat theatreland, this survival is no small achievement, so why so popular? Well, probably because everyone loves Michael Jackson. Even the hardest of hearts can't keep their toes from tapping when Billie Jean starts playing, letting out a quiet "AOW!" when overhearing Smooth Criminal or doing that awesome zombie claw side-to-side dance when the DJ drops Thriller. And, after his unfortunate death, Thriller Live is the closest you're going to get to seeing Jackson perform. Told vaguely chronologically, the show takes us through Jackson's life, from pint-sized prodigy, through his 80s supremacy before concluding rather abruptly in the mid 90s. Given Jackson's many performance talents, no one performer can simulate his stage presence. So, 'playing' Jackson are; a young boy, Eshan Gopal; four lead singers, Alex Buchanan, Treynce Cobbins, Haydon Eshun and John Moabi; and one look-a-like dancer, 'Dajiow'. That it takes six talented performers to summon up a vaguely plausible facsimile of one man proves to be the best (and most subtle) tribute the show makes. Structurally there's no great surprises. Jackson's hits are faithfully recreated by the vocalists and an ultra-tight live band (until they were revealed I'd assumed this all pre-recorded), accompanied by tightly choreographed dance numbers. These are held together by the direct connective tissue of having a guy come out with a microphone and explain what Michael Jackson did next. When the show is going full-tilt it's difficult to find fault - Jackson's big hits are simply that good. An early dose of exuberance from the young and insanely charismatic Gopal as Kid Michael gets us pepped up with excellent renditions of I Want You Back, ABC and Rockin' Robin. Similarly, the later numbers can't fail to impress - with highlights being an excellent Billie Jean and satisfyingly zombiriffic Thriller. These are the numbers punters have pay to see, and here the show delivers. But these peaks of quality come complete with some dips into dullness. Though generally well-performed, deeper cuts like She's Out of My Life, Never Say Goodbye, Human Nature and This Place Hotel sap the energy in the later stages of the first act. This portion of the show is accompanied by an extremely naff audience participation bit whose forced enthusiasm grates. Similarly, a segue into Jackson's Messiah complex years nauseates. "Hooray! Earth Song!" said no-one. Ever. We're assailed by jaw clenchingly trite video displays, one of which has the words 'racism', 'hunger' and 'war' floating around in unhappy looking red font. The next goes even further, showing us pictures of Ghandi, John F Kennedy, Martin Luther King, John Lennon, Mother Teresa and, slightly incongruously, Barack Obama. Then, above them all, the beatific face of Jackson beams down: as if the show is making the case for his canonisation. There are small mercies though - we're not subjected to Heal the World. Though I watched that segment through gritted teeth, it turns out to be the closest the show comes to exploring the more eccentric aspects of its subject's life. Where are the chimpanzees? The hyperbaric chambers? The giant laser-spitting robot? Instead, the show opts to comprehensively sandpaper away all the rough edges - anyone learning of Jackson for the first time through this would assume that Jackson was a boringly professional musician whose career mysterious ended in 1996. Thriller Live is content to provide what's expected of it and nothing more. If any 20th century musician deserves a searching, lavish biopic it's Michael Jackson. This show focuses on the music and does an all round decent job of it. These are some of the most popular songs of the 20th century, beloved by audiences around the world - this show presents them with a minimum of fuss in a show. I can't deny that this is a commercially streamlined, polished experience, but you get what it says on the tin: no more, no less. 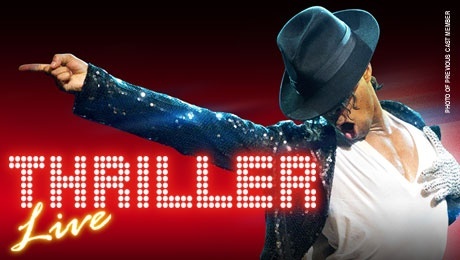 Thriller Live is at the Lyric Theatre. Probably until doomsday. Tickets now 33% off.